I ordered this new cottage on May 9th and it took until now for it to arrive. I had prepared a foundation for it this spring so all I had to do was to set it in place. 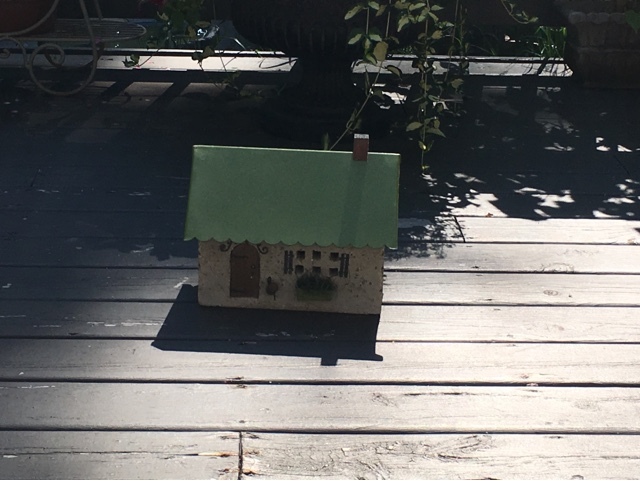 I had chosen a bright green roof so it wouldn't match the red roofed cottage. I asked for a brown door, bleach shutters and the little scrollwork piece in black to go above the door. Thankfully they got it all right! 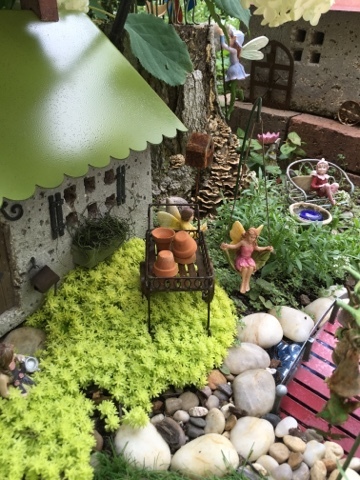 The bright green sedum was planted there knowing I had the cottage coming. I found another garden cart like my old one that was crushed in my little accident I posted about the other day. I decided it would show up better on the bright green sedum. 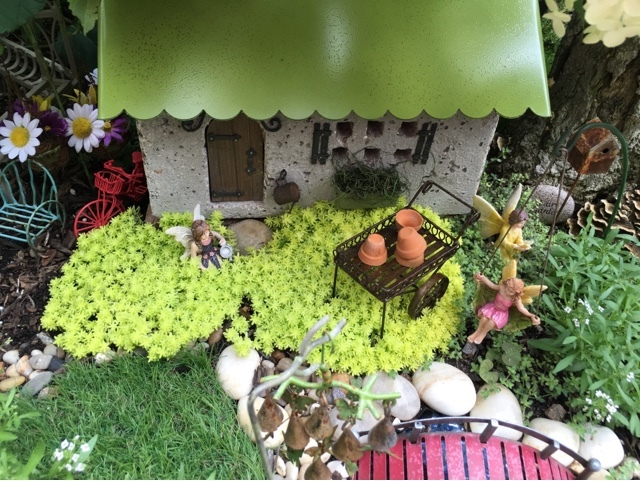 I've relocated a few fairies. When I fell last week the new cottage would have probably caused me more injury and likely have been damaged. Perhaps it was divine intervention that caused the cottage to be delayed so long? The little guy on the bench lost part of one leg. I can't find it either - must have gone deep in the ground. 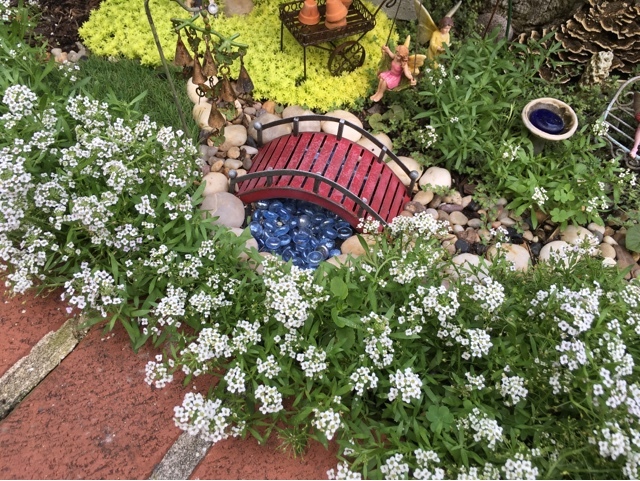 I've had to start trimming the alyssum as it is really taking over. Not complaining because this is the way I wanted it to look. 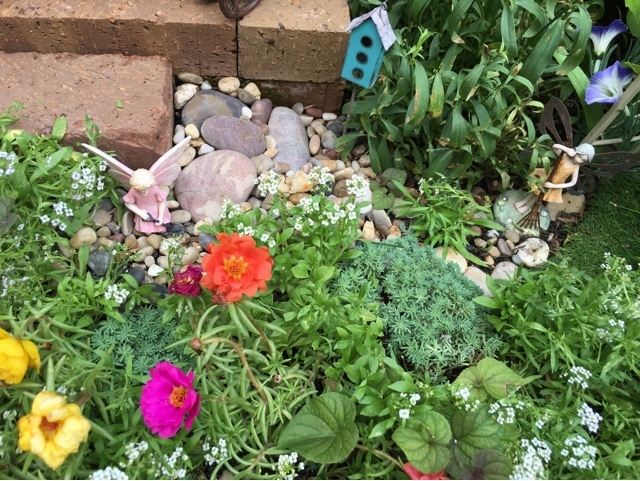 I planted some Moss Rose here too and I love their little flowers mingling in with everything! Next year I'll probably set things up a little differently and create a new look. It just rained for five minutes and now the sky is clearing! It cooled things off. It's been pretty hot here- how about in your area? Thank you all for your kind comments on my previous post. I appreciated hearing from you. 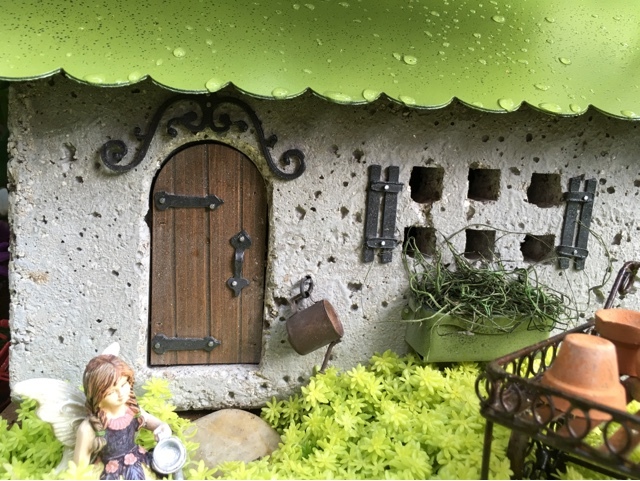 I love your new fairy house...can you post where you buy your houses & fairy supplies? So cute! You've got a little village now. 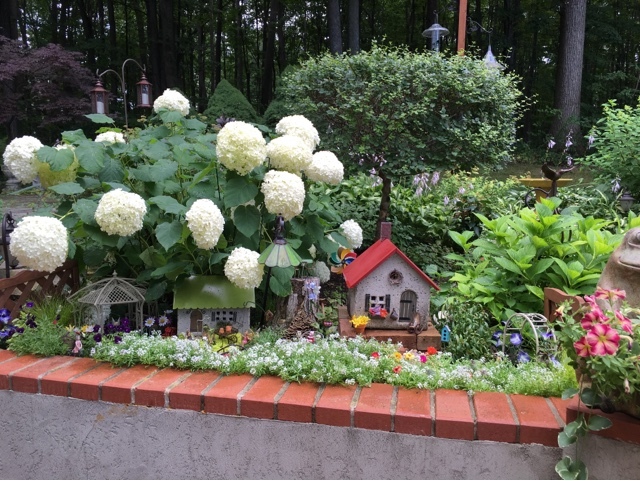 Hi Liz, this little cottage is adorable and worth the wait. 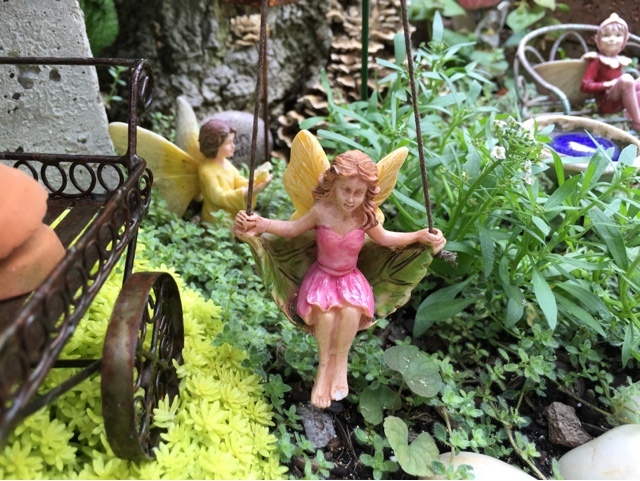 You have styled it perfectly in your fairy garden. Next year, I want to do mine all over inspired by you!! 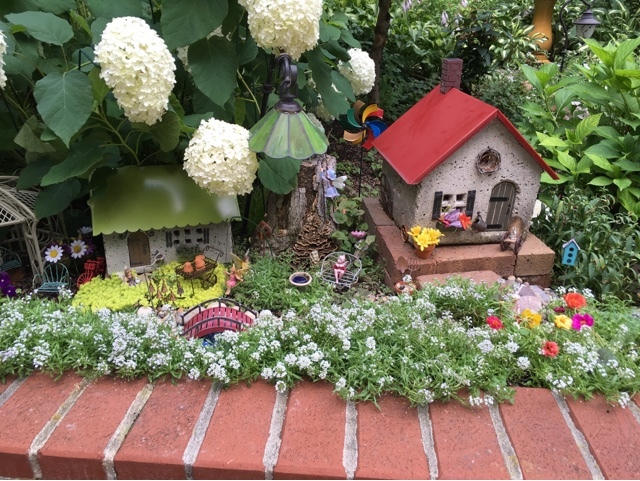 Hands down this is the best fairy garden I have seen online or in person. Your eye for detail is great. 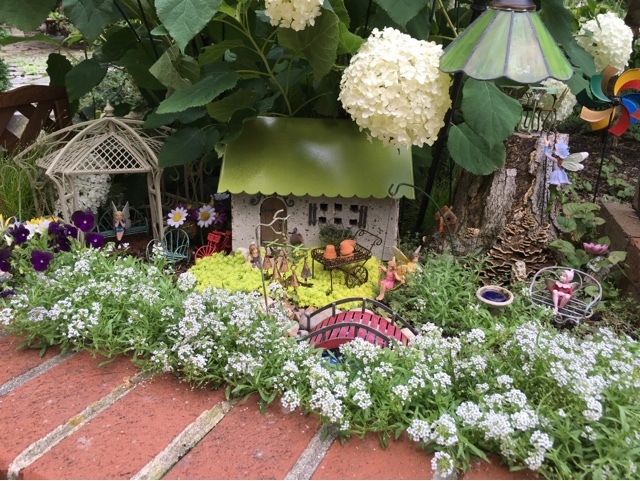 I especially think it is dear that you continue to have the little injured fairy in the garden; it says 'all are welcome'. You both had an injury in the mishap but don't stop. 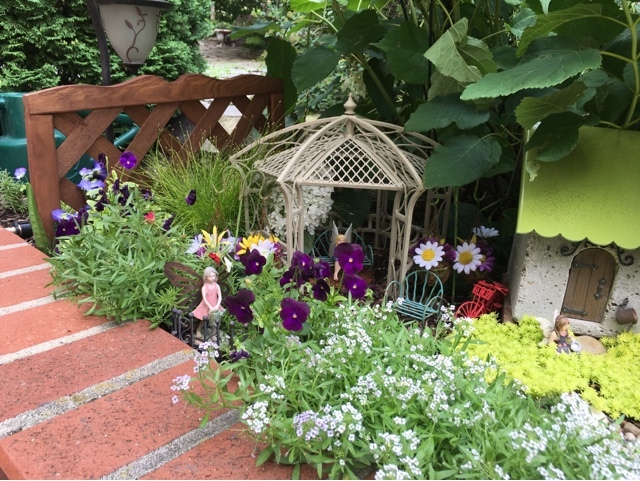 Sweet, sweet garden. 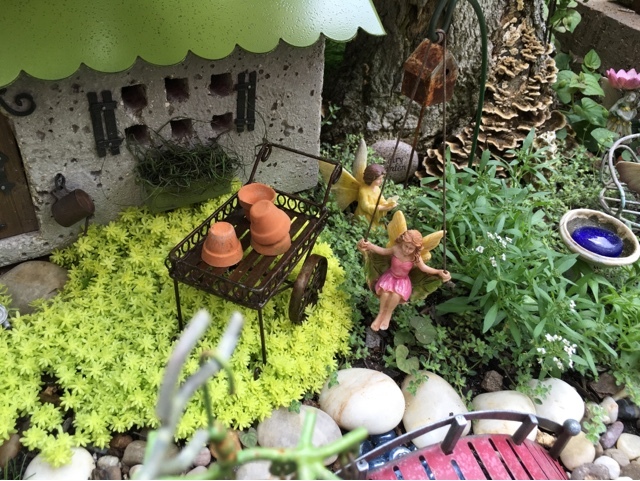 Everything is sweet and just what one would find in a fairy garden. I did see a red BBQ at my local garden center, Naturally I thought of you. How cute your new cottage is, Liz. Love the green roof and brown door. 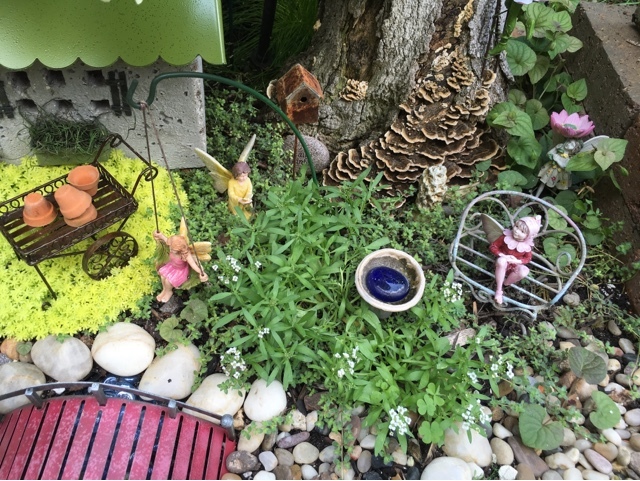 Nice you had a spot ready for the new cottage and fairies moved to greet the new addition.